Doma Natural is one, not the only, way of starting and training young and retraining mature horses. It is not a three-day solution nor is it a wonder method. Doma Natural is a successful horse training method based on natural communication. If you make it easy for the horse to understand you, it will be easy for the horse to learn what you want from him. Based on his future career as leisure, competing or therapeutic partner, every horse gets his own individual training schedule adapted to his character, training level and physical condition. We train horses on the broad basis of experience of over 30 years of horse keeping, breeding and competing in a variety of disciplines like show jumping, dressage and endurance riding in Germany and Chile. Combining fundamental aspects of classic training with modern elements like ground exercises and round pen work we developed our way of natural horse training: The Doma Natural. Understanding and application of natural communication between horses is the key in any relationship between humans and horses. Doma Natural Training is creating an environment that allows horse and human to understand each other and so have a positive communicative learning experience every day. 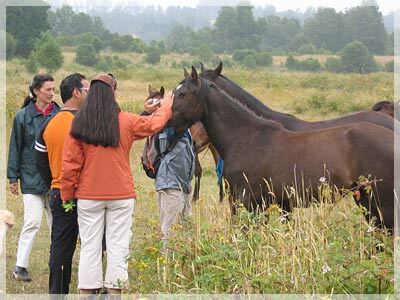 Take the opportunity to learn more about our natural way of horse training and experience Chilean life-style and culture in one of the most amazing landscapes of South America and participate in one of our Doma Natural Training Programs and see testimonials of our participants.